a. What were the advantages to the Scharfmans of buying Heim Cheese rather than starting a new cheese company from scratch? The disadvantages? How well did the Heim Cheese Company fit with the Scharfman’s personal goals? Suggest several reasons that Fred Heim might be selling his company. b. What are the critical success factors for successfully running a cheese business? What skills and abilities and resources do the new owners bring to this business? What critical success factors don’t they possess, and how will they insure that the business continues to have them? c. What valuation technique would you recommend that the Scharfmans use to set a value for the Heim Cheese Company, and why? d. You are helping the Scharfmans prepare a proposal for financing to buy Heim Cheese Company. Prepare an executive summary that describes the company’s business model, marketing strategy, and other key points. What are some ways that they can structure a financial package to purchase the company? Suggest a number of ways they might be able to secure financing beyond their own resources. HATTIE BRYANT: This is SMALL BUSINESS SCHOOL. You might want to grab a pencil if you're interested in growing your business or even starting one. I'm Hattie Bryant. From Wisconsin come Vicki and Paul Scharfman, who will tell you how they did market research to transform an old business. Most of our 30 minutes each week is spent in the small-business Master Class. Vicki and Paul Scharfman, the leaders of the class today, could be your university professors because they have plenty of degrees to show they are qualified. Now you can learn from Vicki and Paul. Step into the Master Class. It's cheese, one of my favorite foods, and now I get to see how it's made. And where else but in Wisconsin? PAUL SCHARFMAN: Let me tell you how you make cheese. Cheese is like a chain-link fence. We start by pouring pasteurized milk into a vat and adding some enzymes and cultures. Now those enzymes break down some of the proteins in milk and link them together to make a chain-link fence. And they trap, in the holes in the fence, globules of fat. That's what curd is. It's just like all the tennis balls caught in a chain-link fence. Then we're gonna have people cut the curd. They'll be cutting the cheese. We push it into a curd elevator, where it's lifted up and then dropped into forms. Then all those forms will be turned period--periodically, covered to keep them the right temperature and then cooled overnight and we then make blocks of cheese. This is what we call the leader plant. We know it has been making cheese continuously for 160 years. These are three-foot-thick fieldstone walls. HATTIE: In 1991, Vicki and Paul Scharfman bought the oldest continuously running cheese factory in the state. PAUL: All right. These are the walls that were--that have been in this building for at least 160 years and have seen that much cheese making, but it was only a few years ago we brought in sandblasters and sandblasted all the walls; had to get them smooth and cleanable so that they could be USDA approved. I get a great deal of personal satisfaction out of found--having found a way to take this small, inefficient little room--whatever it is, it's inefficient--and turning it into a flexible asset, something which can make a little bit of a lot of different specialty cheeses. HATTIE: You won't find the basics coming out of this place. You find cheeses made for niche markets: Kosher, Syrian and Arab cheeses shipped to delis in New York. And the biggest seller? 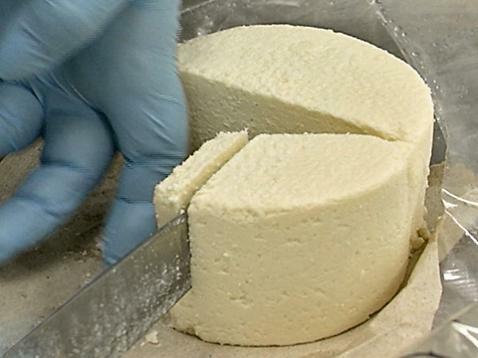 Queso Blanco shipped to Miami, Houston and other cities with large Hispanic populations. How did you land on Hispanic cheeses? HATTIE: I've eaten tons of enchiladas. VICKI: You know? If we could figure out a cheese that Chinese people would eat or Chinese-Americans would eat, boy, would we be out there with a Chinese-American-focused product. PAUL: I was the sales and marketing manager for a subsidiary of Oscar Mayer, Louis Kampf Seafood. Before that I'd been the o--marketing manager for the Oscar Mayer company. And the first week in 1991, the Oscar Mayer company said to me, `You're a great guy, and we don't need you anymore. So have a great life.' They gave me a nice severance package and--pfft. We went to what was called an outplacement counselor, and he gave me a battery of tests, which were--they're a tool. I took a bunch of different tests. None of them were terribly useful, but in total they helped me o--to identify something that I could really believe in. Here are the set of skills that I have and the motivations. I didn't have to like what I learned, but there it is. I learned that what I like to do is to start things, to initiate, to innovate, to get going. Now it wasn't that hard to go the next step and say, `What am I good at?' 'Cause there's the skills and you can go and you can pretty analytically say, `You're good at marketing, and in particular you're good at food marketing.' I'd come out of a dozen years at Kraft, General Foods. `And in particular--particularly, you're good at re--marketing of refrigerated foods.' Before I signed over the money to Fred Heim, we had spent close to $100,000 of our own money in market research. The biggest lesson that I had in this whole acquisition process was learning what I didn't know, OK? It was relatively easy through this outplacement service to learn what I did know, OK? But what I didn't know is a humbling experience. There's a lot you don't know. But once you fess up, then you can go learn it. I went out and got an enormous amount of debt, put up my home and everything I own; and by November of 1991, we had bought the assets of what was then the Heim Cheese Company. HATTIE: The headquarters for what they now call the Specialty Cheese Company is in Lowell, about an hour's drive from Madison. PAUL: I identified a company that fit my desires; they wanted to sell out, needed equity, needed marketing help. And I went to that firm and said, `So what do you do well? What can I build on?' Well, I could say what they didn't do well, because sales were going like this (makes dropping motion). ` What do they do well? They make very good cheese, and they make a Cuban type of cheese. Boy, was it salty, but it's unusual. It's Cuban. Hmm. I wonder if we could build on the notion of Cuban cheese? ' Well, my wife and I batted that one around and it didn't take too long to come up with more Hispanics, more Mexicans, than Cubans, and other types of Hispanics. HATTIE: Paul and Vicki both have MBAs in marketing, and they say their successful turnaround of a dying company is based on market research. Vicki is adamant about it. VICKI: SCHARFMAN: There are many people who go out and say, `I have God's gift to the product world. I have this fabulous invention. Everyone's gonna love it. I'm gonna make a mint. I'm gonna sell a gazillion of them.' They go out and they make this wonderful product, and it sits there and nothing happens. And they can't understand why people aren't buying this, all right? That is completely the backwards approach to marketing. Marketing says, `Find out what your consumer wants, what your consumer needs and what they're not getting from the current offerings in the marketplace, and go out and tailor your dream to what they want.' And that's gonna be the right fit that sells product, OK? So that's the start of it. And, in fact, one of the difficulties in coming into the business that we are in is it's a completely production-driven business. It is not a marketing-driven business. And so you have employees, and it's industry-wide, saying, `You know, we made the same stuff year after year. It sold just fine for my grandpa and it sold fine for my pa and it'll sell well for me.' And it's not true. Markets change. And that's what we felt we would bring to the party, was an understanding of how markets change and to tailor the products. PAUL: The gist of it is simple: ask. People love talking. Ask them about something that they care about, and they will tell you more than you want to know. You want to go and become a manufacturer of golf balls. Have you started by asking people who use golf balls about the product? Have you asked people who play golf a lot, heavy users, about it? You want to go and make stuffing mix. When was the last time you made stuffing? Probably not recently. Who--who makes a lot of stuffing? Have you talked to them? What are the problems? What do they like? What don't they like? It's free. You can do it. VICKI: And before you ever do a survey--surveys are great in their place--you have to do qualitative research. You have to start by talking, either in one-on-ones or a focus group of eight to 12 people, where people give each other feedback and they get excited and they taste the products and they look at them. You start with that, and you frame what the overall issues are and you get a lot of the details. And you can follow that up then with a survey. HATTIE: So it's legwork, discipline, staying focused, asking the same questions over and over and over again. HATTIE: Trying to get this information. PAUL: Hattie, when--when we bought this company, basically what I did to the employees up there is propose marriage. I said, `I don't even want an office up there. I'm gonna be the marketing, the selling part of the company. You guys make the cheese. You've been--you are terrific cheese-makers.' There's more cheese-making expertise in that company than--than anywhere. It's incredible how good those folks are at making and ma--manufacturing wonderful cheese. HATTIE: How long have you been making cheese? LUDWIG ZOLLER: About 42 years. HATTIE: Ludwig Zoller is a master cheese-maker. He and Paul are constantly working on new products. LUDWIG: Yeah. In this type of cheese we're looking for a creamy texture. HATTIE: Mm. See, I think it tastes wonderful. LUDWIG: The taste is there, but it's not quite what we want. I'm hoping this one is. PAUL: My job is to represent the consumer, be it a housewife, an--an individual, a chef, a restaurant owner. And my job is to find out what they need. What we do as a business is use three pieces. We have someone who goes out and has a pretty good rapport with customers and consumers and knows how to get that information. We have assets--very flexible assets. These old cheese factories are inefficient, but, boy, are they flexible. We can do a little bit of anything here--not a lot of anything, but a little bit of everything. And the most important piece is we have real experience, real brains. We have masters who know--who can take weird requests. `Hey, you know, Ludwig, I don't know how to do this, but, look, I need a cheese that is creamier or grittier or with purple spots,' or whatever. HATTIE: How do you do that? PAUL: But you just tasted it. PAUL: Now I taste this other one? HATTIE: Oh, please. So you can't wait to see if it's working, going the way you want it to go--a creamy, gritty cheese. PAUL: Hey, we're getting close. LUDWIG: Next step I already know. I already know. HATTIE: You already know what you're gonna do to this? LUDWIG: I already know what we have to do to change the texture of this cheese. HATTIE: You already know what you're gonna do next. HATTIE: And you're not gonna tell us. HATTIE: Paul says you can grow too fast. PAUL: We had seven cheese-makers originally, licensed Wisconsin cheese-makers, making one product differently. Here we are, we've been in business for a little less than a year. We're just introducing our new pride and joy, the new La Baca Rica brand of Hispanic cheeses, and I pick up a piece of cheese from vat one and a piece of cheese from vat two and they taste different. I can tell. That's not good. What happened? We call back to the office, and they say, `Well, the first vat was made by such and such a cheese-maker and the second vat was made on a different shift or at a different plant.' How could this be? I get the seven licensed cheese-makers in a room and I say, `Guys, I thought we were all making the same cheese.' And they say, `We are.' `How do you make it?' Seven different answers. You can't do that and grow. Slow down. Get one procedure for that product. Make a training manual for your employees. If sanitation is so important in your business, which it is, you better find out what the procedures are for sanitation, how to train people, how to test, how to be sure that you have the quality all the time. Fast growth jeopardizes product quality, and that's what happened to us. So over the course of the second and third years we've evolved into a pattern of weekly core group meetings. Paul would visit the plants every so often; there'd be team meetings. And we had to set up a new notion, and the new notion was team meetings, plant meetings, listening to what the employees said. Now you're growing new products, so now you gotta ask, `So, Leandro, what's it like when we ask you to put paprika on the outside of the cheese?' I can't ask the management; they've never done this before. I gotta ask the person who's doing it. And he'll say, `Well, I really need a dry table or it gets all gummy.' I wouldn't have figured that out. The management wouldn't have figure it out. So you need to develop a culture of bottom up. HATTIE: Vicki and Paul Scharfman are relatively new small-business owners after having spent years educating themselves and working both in non-profit organizations and big corporations. Both have MBAs in marketing, and when they bought Speciality Cheese, they did with it what they would have done in a marketing job with a big company. They did research and continued to do research. Vicki and Paul spent thousands of dollars to come to the conclusion that there was a market for Queso Blanco, their top-selling product today. Had they just continued making what everyone else makes, they would be struggling to compete with the big guys. It seemed so obvious, but, frankly, we know most small-business owners don't do market research. Stop what you're doing now. Hire an outsider. Could be your mom, your friend or a research firm to call some of your existing customers to find out how they really like your product or service. What changes would they like to see? Also, ask yourself who your future customers are going to be. Find a way to interview samplings of this group. Based upon what you learned, make changes, stop guessing what your customers want and start asking. PAUL: The competitive model for industry breaks down in small business. We ought to be more collaborative than competitive, and as a business we believe in that and--and try to do that. We try not to copy our competition but to innovate. We try to build markets. We try to work with our partners and our suppliers and our companies around us. We try to find win-wins all the time. As the biggest meat and--processed meat-maker, Oscar Mayer, it's really hard to collaborate with the number-two guy. We're competitors. We got all the staff, we got all the plants, we are competitors. PAUL: The little local cheese-maker down the street, who's making Colby, and I--other than the fact we're both buying raw milk, we might as well be in different businesses. We are not competitors. HATTIE: So we should change the way we think about that word `competition'? PAUL: Yes. Small businesses collaborate with each other profitably. They don't compete with each other profitably. There's just not enough there. HATTIE: By brainstorming with other cheese-makers, Paul and Vicki came up with their newest product. PAUL: How about this--Vicki--how about a little, cute box? How about a sleeve around the box? We learned here this is a pretty box. And I can see those chips in there. PAUL: Whatever that is, here's a cheese wedge and I can see the chips. Here's a pie plate; I can see the chips. You know what I learned? PAUL: Consumers told us to first say it's cheese and then open up the window. First, say it's cheese--whatever the flavors are, different colors and then open up the window and then--oh, I see, there's chips. HATTIE: Now that the Atkins diet is popular again, they can't make enough to supply the demand. PAUL: If I had a wish for a person who has decided he wants to be in his or her own business, what I would wish they could emblazon on their forehead is: know what you don't know. And once you know what you don't know, you got to go find it out. But you got to fess up first. I don't know that. I don't know how to set up an office. I don't know what my customers want. I don't know how big the market is. I don't know my customers, fine. There's going to be a long list of `don't knows.' Line 'em up, start checking them off. Go learn. My advice to people is don't overrate your own knowledge. You're only one person. A person can do anything, but you can't do everything. HATTIE: Like all entrepreneurial couples, Paul and Vi ckiee find working together exciting. Paul stays on top of production and Vi ckiee works from their home. VICKI: We both believe that we make much better decisions on everything together than either one of us would make individually. You have to multitask, all right? VICKI: It's much easier if you multitask because we both do carpooling. I can be carpooling kids and talking on the car phone at the same time, and you have to be extremely organized. We do have the flexibility not to be on someone else's schedule. Yes, phone calls are made during the business day, but because we operate across multiple time zones, I can do California later at night. Frequently I'm coming--all last--there was a week--two weeks ago where I was coming home and talking to Texas from 10:00 to 11:00 every single night, which, yes, it drove me a little crazy because I'd already put in a very long day at that point. But you can--you can organize yourself timingwise and then we work at night. We both you know, when the children go to bed, we come back and we work some more. HATTIE: Paul drives this '83 Toyota with 260,000 miles on it. He let his kids do the paint job as a birthday gift. PAUL: Hattie, I bought a lifestyle. In addition to buying the assets for a company and all the rest, I bought a lifestyle of balance. By scaling back my operation, I can scale back the number of people who need me and I could have a family life which includes teaching math at my children's school, being in the PTO, coaching soccer and basketball, being a husband and a father, not just a businessman. HATTIE: You might think all small business owners live the lifestyle of the rich and famous. I don't think so.